Attention fellow globe-enthusiasts: The good folks at Sky & Telescope Magazine have collaborated with members with NASA's Mercury-mapping MESSENGER team to create the first complete globe of our solar system's innermost planet, and it's beautiful. Do want! For centuries, our solar system's innermost planet was shrouded in mystery. 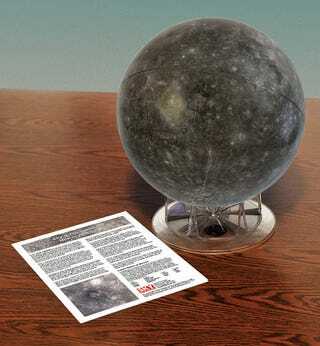 Now, for the first time ever, you can use a globe to explore Mercury's entire surface! This new Sky & Telescope 12-inch globe was made possible by NASA's Messenger spacecraft, which recently finished imaging the entire planet. The base map comes from about 18,000 Messenger images, and special image processing has preserved the natural light and dark shading of the surface. The globe, which looks remarkably detailed, includes the names of more that 350 craters and planetary features, "named after famous artists, musicians, painters, and authors." The globe runs 100 bucks and is available thru Sky & Telescope.